Glides on smoothly to lock in hydration and create gradual, subtle color. Specially developed for use on wet skin. When blended with water, Wet Skin Moisturizer glides on to instantly lock in moisture and gradually build natural-looking color each day. Ingredients: Water, Glycerin, Mineral Oil, Dipropylene Glycol, Ethylhexyl Isononanoate, Dihydroxyacetone, Butyrospermum Parkii (Shea) Butter, Isopropyl Palmitate, Ethoxydiglycol, Dimethicone, Polyquaternium-37, Fragrance, Ethylene/Propylene/Styrene Copolymer, PEG-2 Dimeadowfoamamidoethylmonium Methosulfate, Ceteareth-20, Dimethiconol, Methylparaben, Butylene/Ethylene/Styrene Copolymer, Phenoxyethanol, Hexylene Glycol, Ethylparaben, PEG-45M, TocopherylAcetate, Erythrulose, Citric Acid. Instructions: Use in place of your daily body moisturizer and subtle color will gradually appear. Once ideal color is reached, use every other day to maintain. Directions:1. Apply on Wet SkinAfter showering, with the water off, glide the lotion evenly onto wet skin. Start with a dime-size on each arm and a quarter-size on each leg and adjust as needed.Use sparingly around elbows, knees and ankles.2. Dry & GoNo need to rinse off or wait. Simply pat dry before getting dressed. Leaves no color residue behind, letting you get ready immediately. Color stays on you, not on your towel wash hands after use. I think this lotion works even better than the original... I use it during the summer after a shower to get my summer tan started. You simply wash your face and then put a dime sized amount of lotion on your skin at a time. Afterwards pat your skin dry. The miracle is that the towel you use will NOT be stained at all! After a few minutes you'll notice a slight tan forming. Also the smell is pleasant and not horrible. I received this in my Walmart beauty box and I gave it a try but I didn't expect to actually love this product. I have very fair skin and do not tan, if I got out in the sun I must wear sunscreen or I burn. I have tried other tanning products before and always have back luck with them being orange or getting a glob of dark in one spot or having streaks or something. I just put this on and at first, I didn't notice much but I went to bed and next morning it looks like I had some nice color and warmth to my legs that I never have. This stuff is the BOMB! I will definitely be keeping this on hand all summer and probably in the winter too. It was the most natural fake tan I have ever had from any product. It doesn't rub off on anything either. It's not going to be uber dark but will give you a look of healthy color. 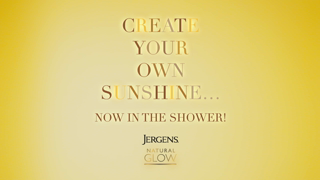 I recently received a sample of Jergens Natural Glow Wet Moisturizer in my beauty box. First off, let me say that I've been a fan of the Natural Glow line for years. I use the Natural Glow Firming lotion practically year round. It gives me a nice natural glow and my skin never looks orange. On the downside, it does leave a odor. I immediately started using the wet skin moisturizer and I think I found my new favorite product! I apply the moisturizer right in the shower and just pat myself dry. The lotion is very smooth and there is NO odor, which I love. After about 2-3 days, I began noticing the color. Just like the original Natural Glow lotion, my skin has a nice, soft glow. People are always telling me that I look like I just returned home from vacation. Great product!